A native North American solitary bee foraging on eastern prickly pear cactus. Often called the "forgotten pollinators" native bees and other native pollinating insects receive little media and scientific attention compared to the non-native honey bee. The prickly pear cactus is an endangered species in Ontario. 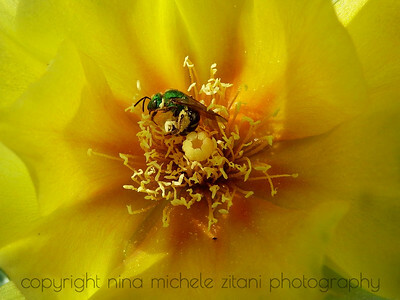 Make sure to purchase native plants for your garden from reliable, locally sourced native plant nurseries, and never collect plants from the wild (bee: Apoidea: Halictidae: "Agapostemon texanus"; plant: Cactaceae: "Opuntia humifusa", Species at Risk in Ontario). Birds depend on bugs, and bugs depend on native plants. If you want an ecosystem in your backyard, you need to plant native species. This is the essence of biodiversity gardening (Great crested flycatcher, family Tyrannidae, "Myiarchus crinitus"; red oak family Fagaceae, "Quercus rubra"). In late May in Ontario. Caterpillars themselves are not pollinators, but they grow up to be pollinators. Most cats* feed on fresh green leaves of their food plants, and many are highly specialized on native species. If you want beautiful moths and butterflies flying around your garden, you'll want to plant the food plants of the caterpillars. You'll need to plant native species. Caterpillars are fascinating animals in their own right, and a major food source for birds. Native plants attract the insects, insects attract the birds. This is what biodiversity gardening is all about. The image shows the defensive display of a papilionid. All papilionid cats have an osmeterium (forked red structure), or an everscible gland behind the head that emits a foul odor, warding off potential predators (Cat: Papilionidae: "Papilio cresphontes"; plant: Rutaceae: hop tree, "Ptelea trifoliata"). *those of us that love caterpillars refer to them as "cats" for short. 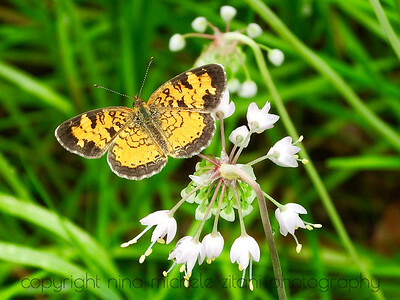 The pearl crescent or the northern crescent butterfly on nodding onion (butterfly: Nymphalidae: "Phyciodes" sp. 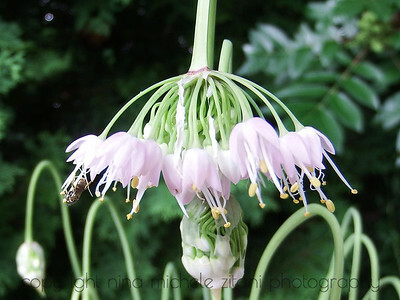 ; plant: Amaryllidaceae, "Allium cernnum"). The great golden digger is a parasitoid sphecid wasp specializing on Orthoptera. Adults are pollinators. 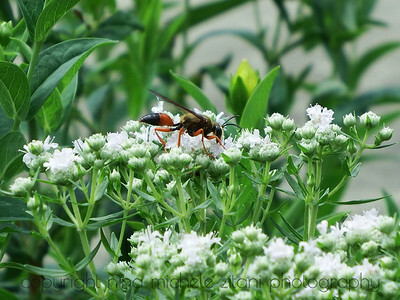 Shown feeding on the floral resources of Virginia mountain mint (wasp: Apoidea: Sphecidae: "Sphex ichneumoneus"; plant: Lamiaceae: "Pycnanthemum virginianum"). A native North American bird on its native food plant. 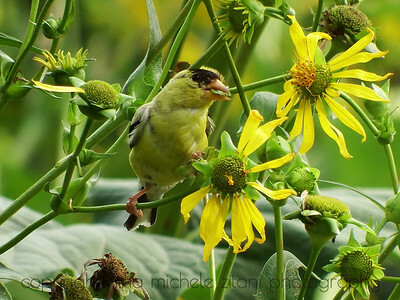 Goldfinches love cup plant seeds, and we often have flocks of 10-12 feeding in our biodiversity garden in late summer. 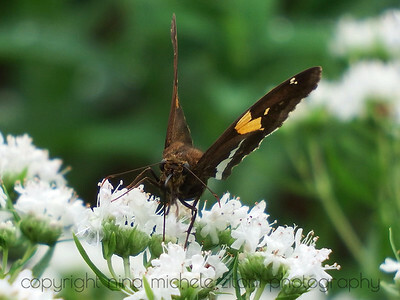 Canada's largest skipper, the silver spotted skipper, nectaring on Virginia mountain mint in our biodiversity garden (butterfly: Hesperiidae: "Epargyreus clarus"; plant: Lamiaceae: "Pycnanthemum virginianum"). The fresh green leaves of milkweeds support the caterpillar of the monarch butterfly and other milkweed specialists. 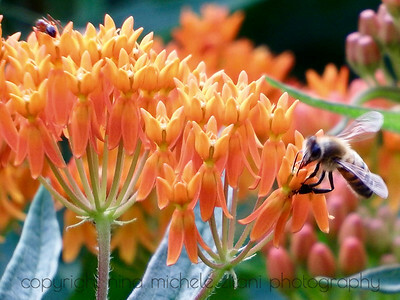 The flowers support insect pollinators of all sorts including the non-native honey bee shown here (plant: Apocynaceae: "Asclepias tuberosa"; bee: Apidae: "Apis mellifera"). 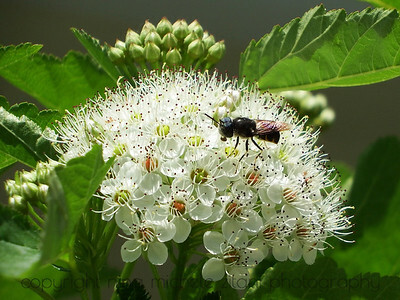 Many fly species (order Diptera) visit flowers for food. When they move around from flower to flower gathering food they unknowingly transfer pollen from one flower to another. If a pollen grain lands on a receptive stigma (female flower part), pollination occurs. Fly on ninebark in our biodiversity garden in spring (Insect: order Diptera; plant: Rosaceae: "Physocarpus opulifolius"). A monarch butterfly nectaring on the tiny flowers of cup plant in our biodiversity garden in summertime. 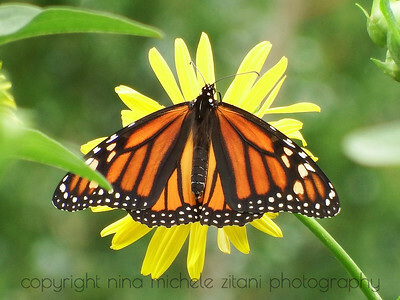 Adult monarchs may take nectar from flowers of native and non-native species, but the caterpillars can eat only the leaves of native milkweed plants (butterfly: Nymphalidae: "Danaus plexippus"; plant: Asteraceae, "Silphium perfoliatum"). 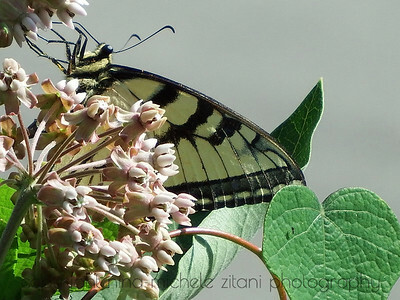 A tiger swallowtail drinks nectar from common milkweed flowers using its straw-like mouthpart called a proboscis. 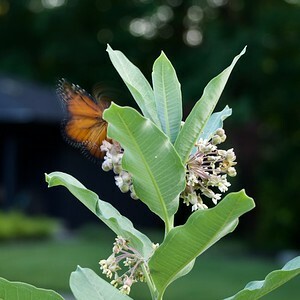 Common milkweed is an essential biodiversity garden plant for two reasons: the leaves provide food for numerous specialist insects including caterpillars of monarch butterflies, and the flowers are an important source of food for pollinators. The curved stem and leaf on far right belongs to Canada moonseed (butterfly: Papilionidae: "Papilio canadensis"; plants: Apocynaceae: "Asclepias syriaca"; Menispermaceae: "Menispermum canadense"). 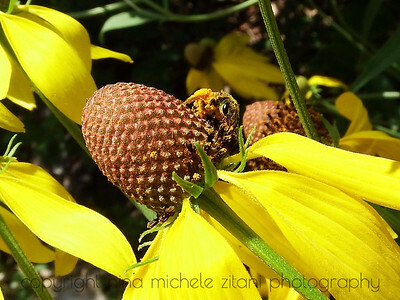 A solitary sweat bee foraging on the disc florets of native pinnate prairie coneflower (bee: Apoidea: Halictidae: "Halictus" sp. ; plant: Asteraceae: "Ratibida pinnata"). 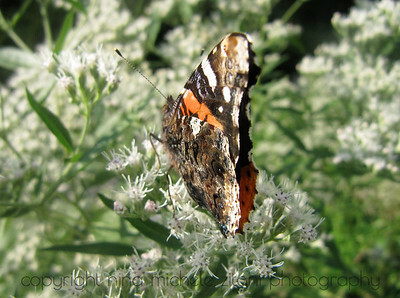 This butterfly is nectaring on a native plant commonly called tall boneset or tall thoroughwort. This plant is a member of the daisy family, but the small flowers are not typical-looking daisies. For plant nerds, the flowers are lacking ray florets. 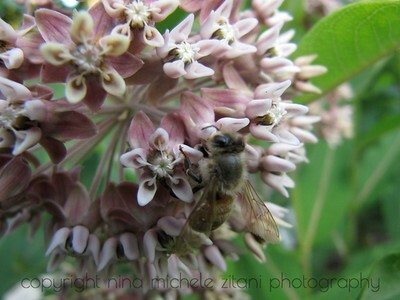 Abundant blooms are an important food source for pollinators in late summer and the flowers have an amazing fragrance! Butterfly: "Vanessa" sp., family Nymphalidae; plant "Eupatorium altissimum", family Asteraceae. A tiny native sweat bee gathering pollen on the rare plant nodding onion (bee: Apoidea: Halictidae; plant: Amaryllidaceae: "Allium cernuum"). 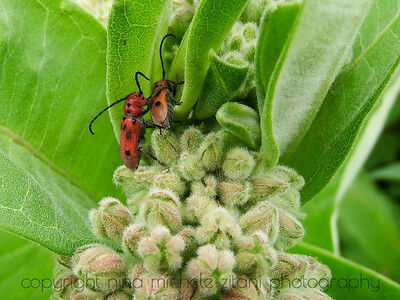 A pair of red milkweed beetles on common milkweed in mid-June, when the flower buds are young and the leaves are soft (beetle: "Tetraopes tetrophthalmus", family Cerambycidae; plant: "Asclepias syriaca", family Apocynaceae). 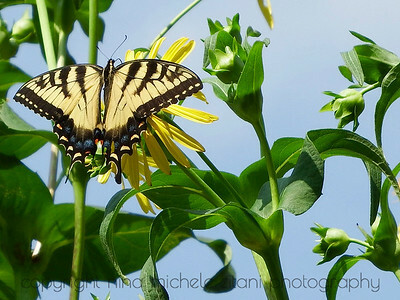 The giant swallowtail is North America's largest butterfly. 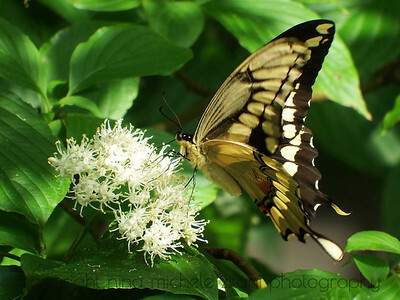 Pictured in our biodiversity garden in spring, it is nectaring on the tiny flowers of native pagoda dogwood, (butterfly: "Papilio cresphontes", family Papilionidae; plant: "Cornus alternifolia", family Cornaceae). 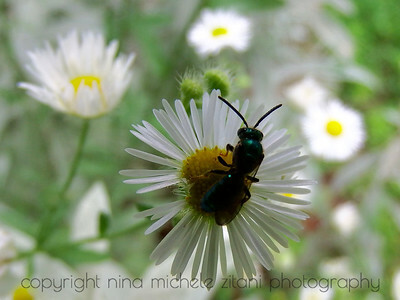 A small sweat bee, probably a male due to the blueish color, on daisy fleabane (bee: Apoidea: Halictidae: "Augochlora pura"; plant: Asteraceae: "Erigeron annuus"). 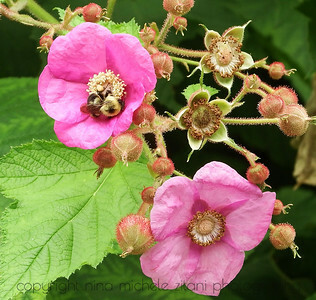 A native bumble bee gathering food from flowering raspberry, one of several gorgeous native roses (bee: Apoidea: Apidae: "Bombus" sp. ; plant: Rosaceae: "Rubus odoratus"). 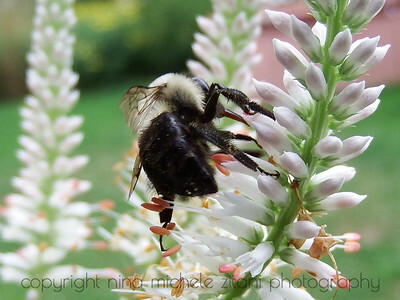 A native bumble bee gathering food from culver's root (bee: Apoidea: Apidae: "Bombus" sp. ; plant: Plantaginaceae: "Veronicastrum virginicum"). The tiger swallowtail drinking nectar from the tiny flowers of a native daisy (butterfly: Papilionidae: "Papilio canadensis"; plant: Asteraceae "Silphium perfoliatum"). 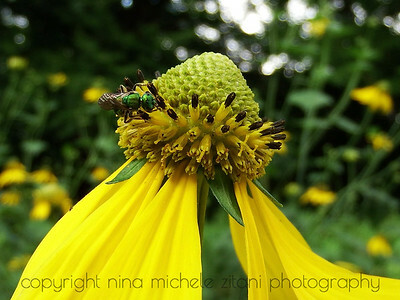 Green iridescent solitary sweat bee foraging on the outer disc florets of native green-headed coneflower in our garden (bee: Apoidea: Halictidae: "Augochlora pura"; plant: Asteraceae: "Rudbeckia laciniata"). "Asclepias syriaca" commonly called milkweed, larval food plant of the monarch butterfly. Also an important pollinator plant, shown here with the non-native honey bee. Family Apocynaceae (dogbane or milkweed family).